Not everything went awesomely in Mexico. Here are the things that didn’t end up in the plus column. I fished on the flats for two days without Nick and on those two days I saw one group of 3 bonefish (I saw other fish, but just not many bones). I was on flats that certainly LOOKED like they were going to hold bonefish. The habitat looked right. The depth was right. 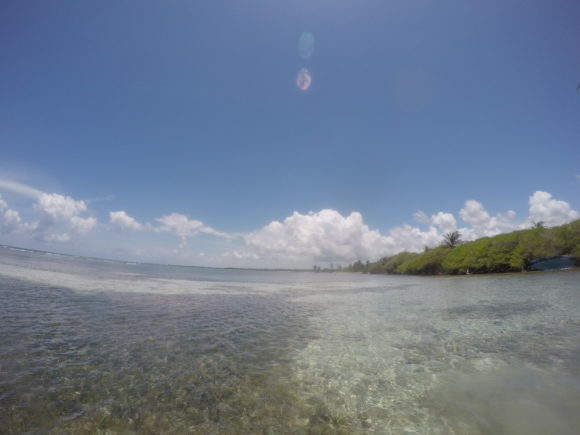 There were other fish around… saw a lemon shark and a nurse shark and several cudas… a jack… and just almost no bonefish. I know they are there. People see them. People catch them. I am not a novice. I can spot fish. So… what the hell was I doing wrong? To be honest, this was the single biggest disappointment of the trip. I has thought it would be kind of like Belize, which isn’t too far away, and the bones would be, ya know… kind of everywhere. It wasn’t that way, at least not for me in late July. Dear god it was hot. I needed to hydrate like it was my means of providing roof and sustenance. It was hot. It was center-of-the-sun kind of hot. The heat was a bit of an issue for my dad. The last day he had to stop fishing before most of the fishing was really even started. Keeping my dad from having heat exhaustion was a priority and we certainly came close, or crossed over, that line… fast. There was a lot of the stuff. It clogged a few flats that should have produced. It seems when there is 30 or 40 feet of the stuff at the shoreline, it heats up and discolors the water near it. I think that might have discouraged fish to hang around. Sargassum is a hit or miss thing. Some flats were free of the stuff. Some were full of it. One flat I went to was so full of sargassum there was a cliff of the stuff, three feet high. My god. There is a lot of plastic on the beaches. Washed up from who knows where, it has ended up in Mexico. Tons of it. Roughly a bazillion, gazillion tons of it. A bit depressing. So, when do we start using this stuff to 3-D print houses and stuff? There it is… the getting there, the good and the less good. Mahahual 2017 is in the books and I’m facing a long lay-off until I end up somewhere salty with a fly rod in my hand. It was a good trip. It was a tough trip. It was a memorable trip. This entry was posted on Wednesday, August 2nd, 2017 at 6:54 am	and is filed under Locations. You can follow any comments to this entry through the RSS 2.0 feed. You can leave a comment, or trackback from your own site. How was water temperatures on that flat during the day? Could be too high I guess. I think it was the heat. I didn’t have a thermometer, but some of that water felt hot. Fishing the ocean side flats in that area can be difficult for sure. I was under the impression that you’d do that for a day and then have your boys run you down to Chet Bay & fish the countless inside flats 30 min. +/- to the south. That’s where most of the video you posted (“another fishing video – Mexico”) in your pre-trip blog was shot. The fishing can be insane there with countless chances at all kinds of species. Hey Kelly, Yeah, I wasn’t blaming the plastics on the locals at all. There is really zero possibility all those plastics came from the local population. I’d say about 98% of that washed up on the beaches. It is in places that don’t have people nearby at all. It is global plastic. It is American plastic. It may be from cruise ships too, but I think most of it is just from, well… everywhere. 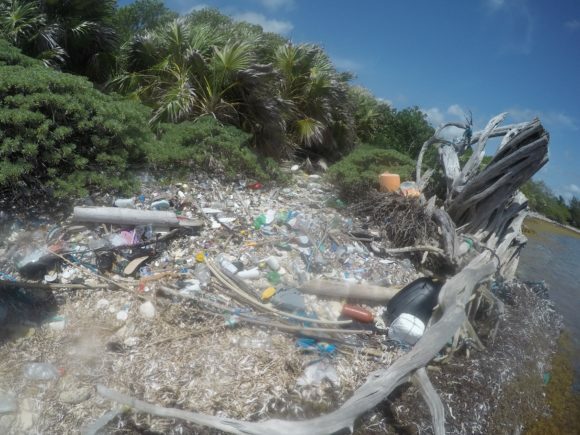 It just underscored that plastics, global plastics, are a real problem and they are washing up in such amounts and in such remote places, that it will become the defining feature of some truly amazing places. Don’t know what to do about that.